So you have some boneless, skinless chicken breasts? Need an idea what to make with them? With a few kitchen staples you can turn plain chicken breasts into a delicious entrée in less than 30 minutes. Yes, even Rachael Ray would be proud of you. And while your chicken is cooking, go ahead and sauté some fresh vegetables to serve on the side. Add olive oil to sauté pan and turn heat on medium high. Sprinkle salt, pepper, garlic powder and paprika on both sides of chicken breasts. 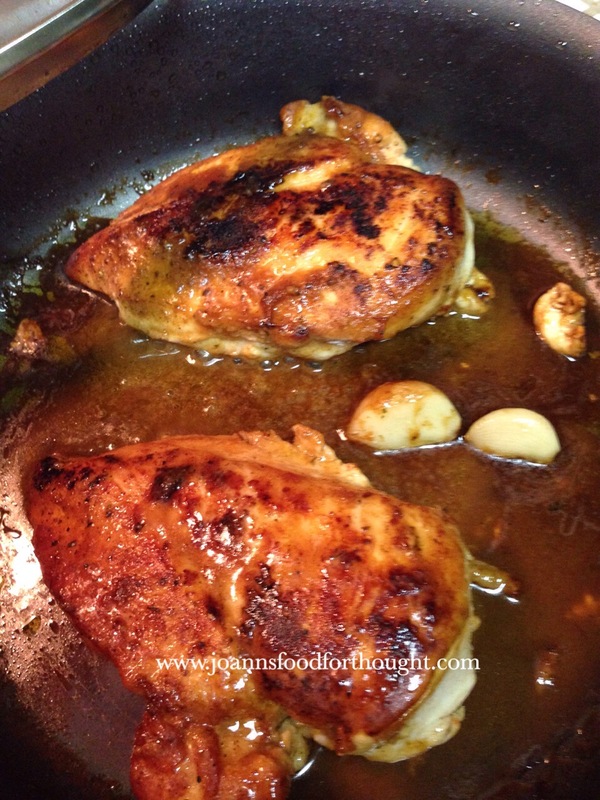 When oil ripples, carefully place chicken breasts in pan. Reduce heat to medium. Add garlic cloves, wine and chicken broth. Turn chicken over after 5-6 minutes. Squeeze other 1/2 lemon to juice on top of each of the cooked sides. Cook chicken breasts for another 5 minutes until done. Do not over cook. 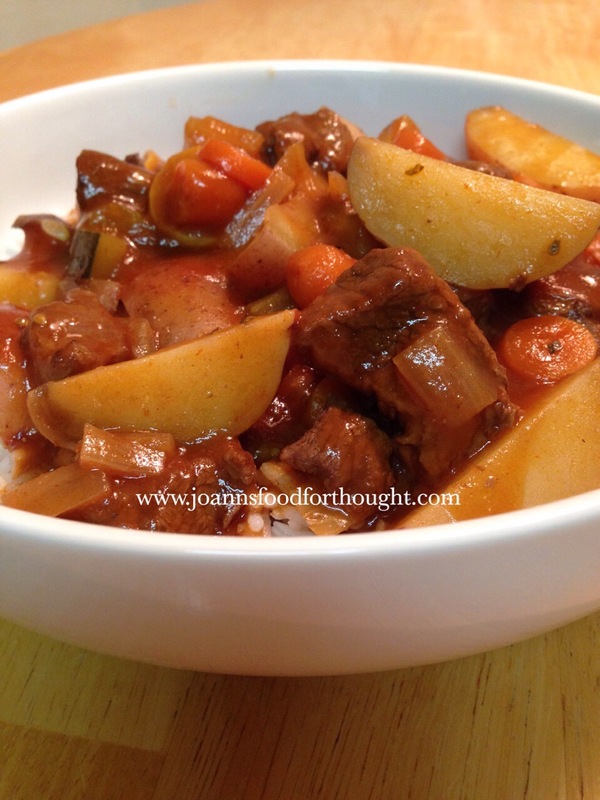 Cold weather and a hot pot of beef stew. There’s nothing better than comfort food. And what’s better than a one pot main dish? I love to cook and bake. But I hate the clean up afterwards. If it can be made in one pot, you bet I’ll be the first to jump at that recipe. After a day of running around in the cold, a bowl of hearty stew sounded especially good. I happened to have a good assortment of vegetables on hand, but this can be made with just potatoes and carrots if you like. Add or omit vegetables to your taste. 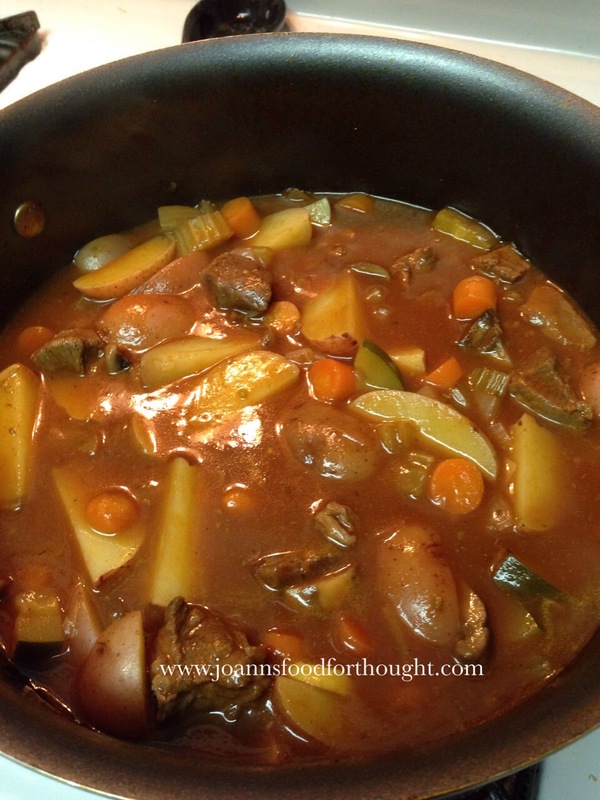 Add onions, carrots, celery and mushrooms and sauté with stew meat for 1 minute. Add tomato sauce, beef broth, Worcestershire sauce, and wine and stir. Add garlic powder, salt, pepper, anise seed and Italian seasoning and stir well. Turn heat to low, cover and simmer for 1 hour. After an hour of simmering, turn heat back up to medium high and add potatoes, stir and let cook for 20 minutes. During the last 5 minutes of potatoes cooking in the stew, add yellow squash and zucchini and stir into stew. Make a slurry in a small bowl using the cornstarch and cold water. Add to stew and stir. The slurry will thicken up the sauce to make it more of a gravy consistency. Once sauce has thickened, your stew is ready. One pot and small bowl to clean. Not a bad deal for the hour plus cooking time you had to wait. Okay, I’ll admit it. I am addicted to chicken wings. The saucy and spicier the better. But sometimes I want the spice, but not the saucy mess. I came across salt baked chicken wings on the appetizer section of a local Chinese restaurant one day and decided to try them out. They were pretty good. But I think their description was off, since the wings were fried not baked. And so I thought, “Hmmm..I could make these.” Here’s my version. Enjoy! 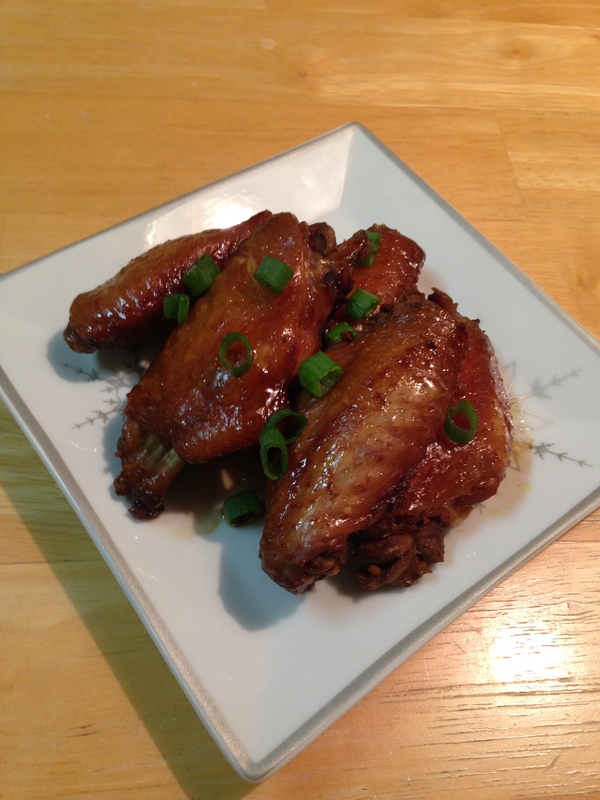 Marinade wings in Chinese cooking wine, soy sauce and 1/4 tablespoon white pepper for 20 minutes. Drain wings and pat dry with paper towels. Pour oil to the depth of 2 inches in a wok or high sided pot. Heat oil on high to 375 degrees on a deep-fry thermometer. In a mixing bowl add cornstarch, kosher salt and remaining white pepper. Add wings toss and coat. Shake off excess. Add wings to hot oil and fry 6 to 10 minutes, until deep golden brown and cooked through. You may have to cook in batches depending on pot size. Using a slotted spoon, transfer wings to paper towels to drain briefly. In another wok or high sided pot, add 1 tablespoon canola oil and heat on high. 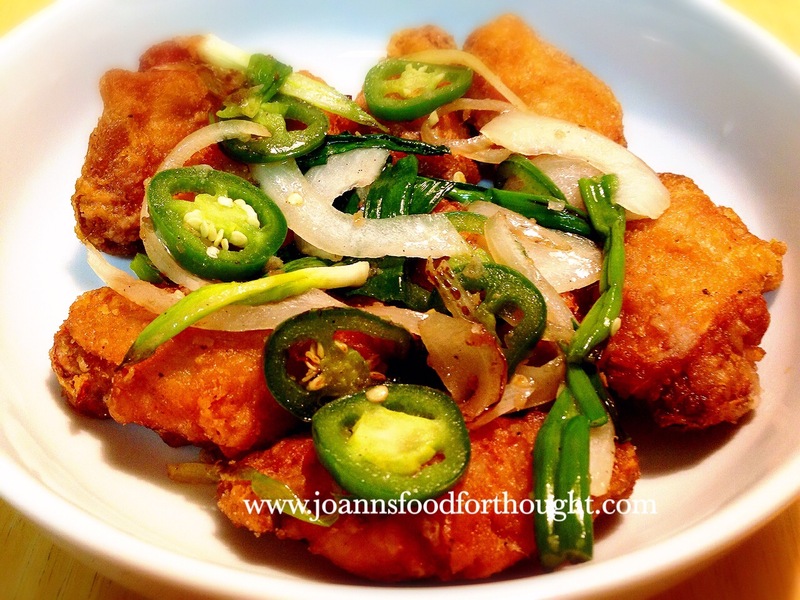 When oil ripples, add Serrano peppers, white onions, garlic, green onions and optional Sriracha sauce. Sauté until aromatic, about 1 minute. Add the fried wings and sauté until wings are coated with the vegetable mixture, about 30 seconds. In a heavy stock pot add olive oil on high heat. When oil ripples, add diced carrots, celery, onion and garlic. Saute for 5 minutes. Add ground beef. Mince ground beef until browned. Once ground beef is browned, discard fat from pot. If using San Marzano tomatoes, mash-up with potato masher or your fingers. Add tomatoes to vegetables and beef. Add beef (or vegetable) stock, both types of beans, Italian seasoning and pepper. Stir and mix well. Lower heat to simmer for 45 minutes. 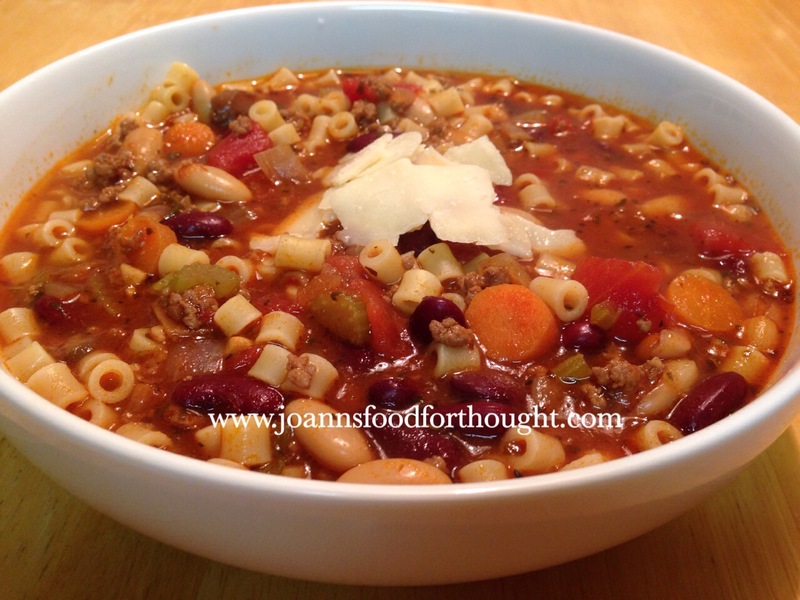 If you have enough hungry eaters to finish the entire pot of soup, add ditalini noodles during last 10 minutes of simmer. Otherwise, cook ditalini noodles in separate pot and serve into individual bowls as needed. Cheesy, meaty, saucy heaven. 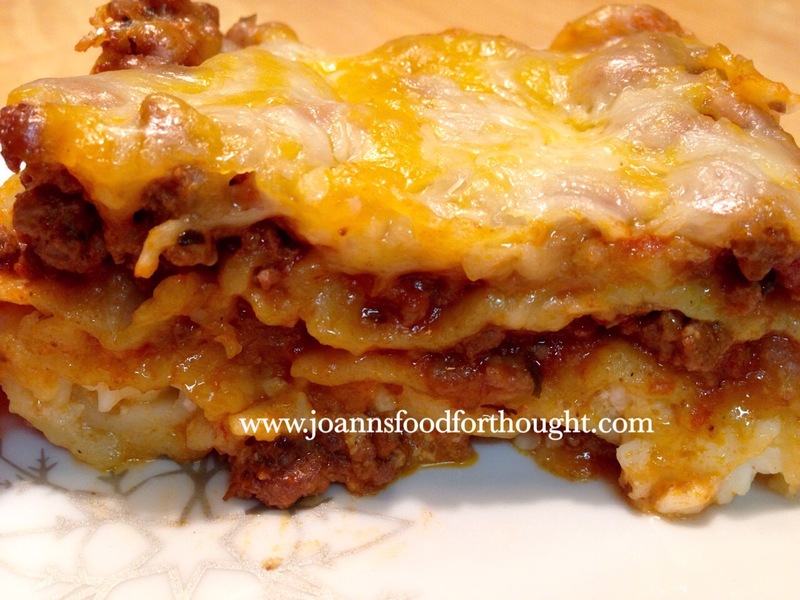 Nothing beats a cold winter’s day than coming home to a hot plate of lasagna. Growing up, my mom worked swing shift so dinner was usually made by my dad. Needless to say, lasagna was not on his repertoire of dinner items. So, lasagna was something I had to learn to make myself. Through the years my tastes and cooking style has matured. I’ve learned to make lasagna many different ways. But I always come back to my first recipe. This recipe is tweaked a little since the 10-year-old back then was not allowed access to wine. But otherwise, it remains true to my younger version. Pre heat oven to 350 degrees. Spray 9X13 casserole pan with cooking spray or rub all sides of pan with vegetable oil. Set aside. Add olive oil to sauce pan. Turn burner heat to medium high. When oil ripples, add diced red onion and mushrooms. Saute for 5 minutes until onions and mushrooms are tender. Add ground beef and separate and cook until browned. Once ground beef is browned, discard any fat from pan. Lower burner heat to low. Don’t forget to turn off burner. In the 9X13 casserole pan spoon a thin layer of sauce on bottom. Next add another layer of lasagna noodles. Now add half the sauce you prepared earlier over that layer of noodles. Add your final layer of noodles. Add the last half of sauce. Be sure to get more sauce around the edges of noodles, rather than the center. This will ensure the edges get cooked as well and not burn. Add the remainder of the Italian blend cheese on top. 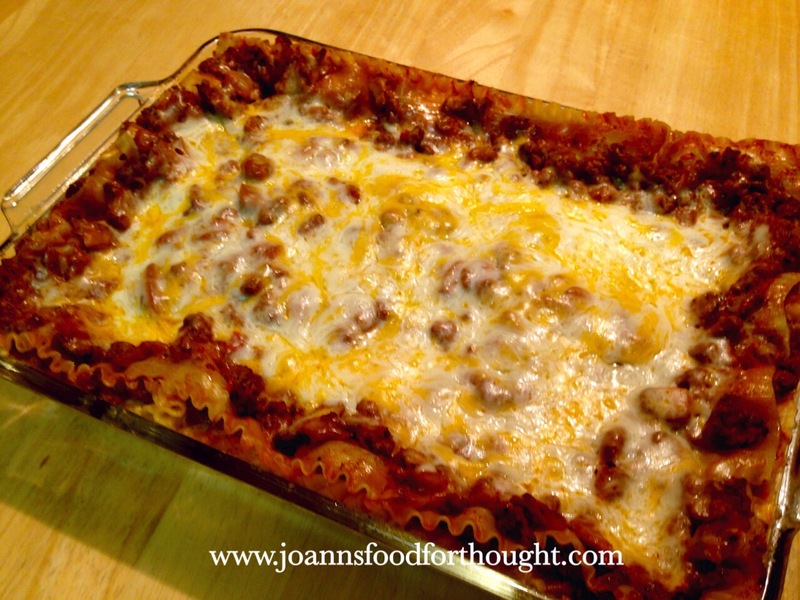 Cover casserole with foil. Cut vent holes in foil with knife or fork. Place casserole on baking pan to catch drips and prevent oven burn. Uncover and let sit for 5 minutes before cutting and serving. Enjoy a piece of my childhood! In a hurry? Who says you can’t whip up a main dish in 15 minutes? 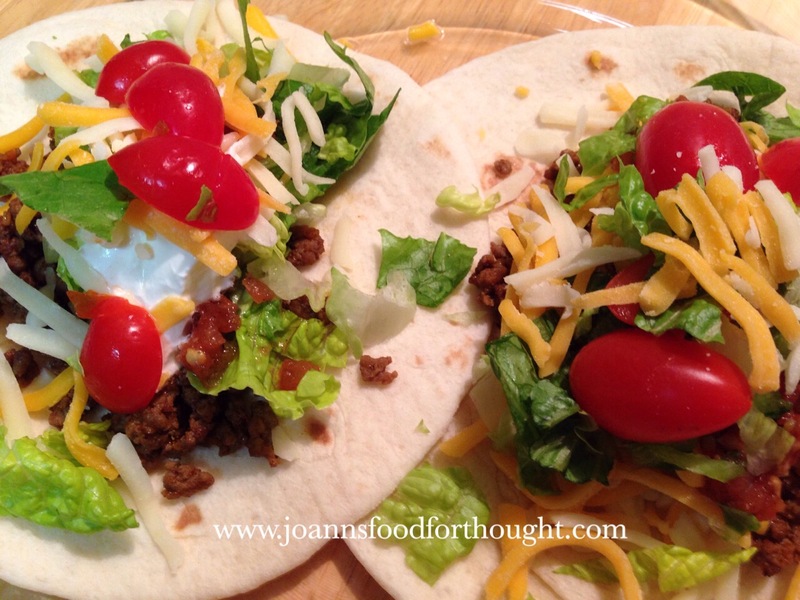 Tacos are one of my go to recipes for those days where I just don’t feel like cooking an elaborate meal. The best part is everyone gets to build their own tacos with items they want. So the picky eaters in your family will even be happy. Add 1 tablespoon olive oil to saute pan. Turn heat to medium high. When oil begins to ripple, add ground beef. Brown ground beef separating into small pieces. While beef is browning, mix together chili powder, paprika, garlic powder and cumin in small bowl. Add seasonings to beef and stir. Add tablespoon of cold water to help seasoning mix and coat meat. Bring mixture to a boil and then turn down heat to low. Cover pan. Let simmer for 5 minutes. Serve with your choice of toppings. Enjoy! Tired of the same old chicken recipes? Try this versatile marinade. It works well with all chicken parts. And you can either bake your marinated chicken or grill it. Best of all the prep time for the marinade is less than 5 minutes. Besides the chicken you will only need six other ingredients and a Ziplock bag. Combine light brown sugar, soy sauce, lime juice, red pepper flakes, curry powder and garlic in a large Ziploc bag. Add chicken. Seal and marinade at least 4 hours or overnight. Be sure to turn occasionally. Pre heat oven to 350 degrees or pre heat your grill to medium high heat. If oven cooking: place chicken in single layer in baking pan along with marinade. Bake for 1 hour. 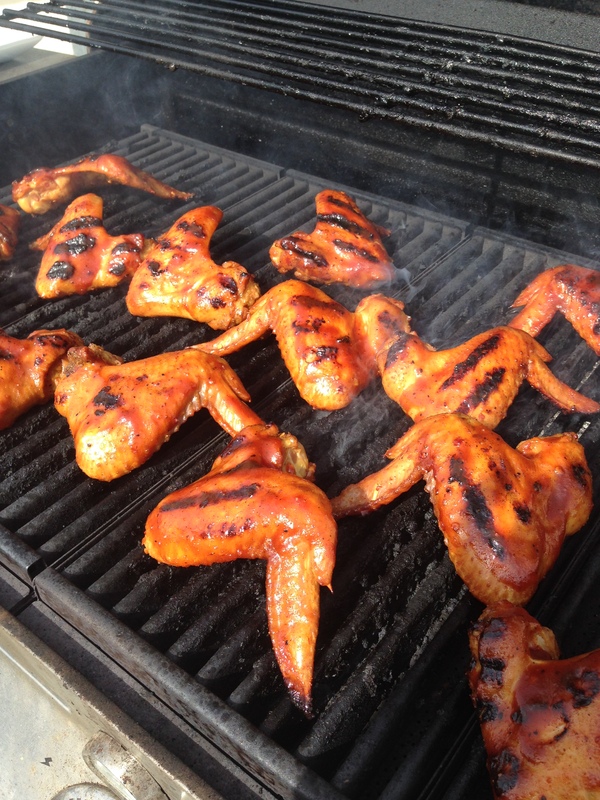 If grilling: remove chicken from bag, reserving marinade. 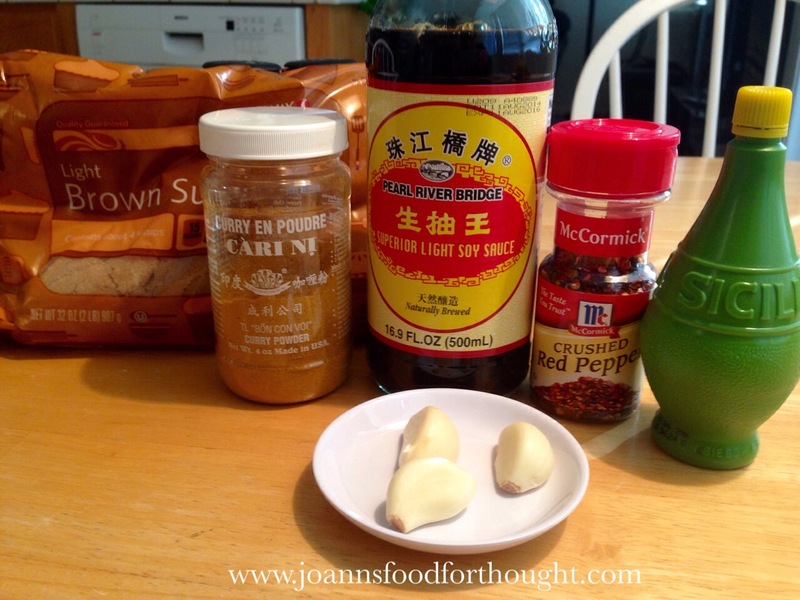 Place marinade in saucepan. Bring to boil and let cook for 1 minute. Use cooked marinade for basting on grill. Coat grill rack with cooking spray and place chicken on grill. 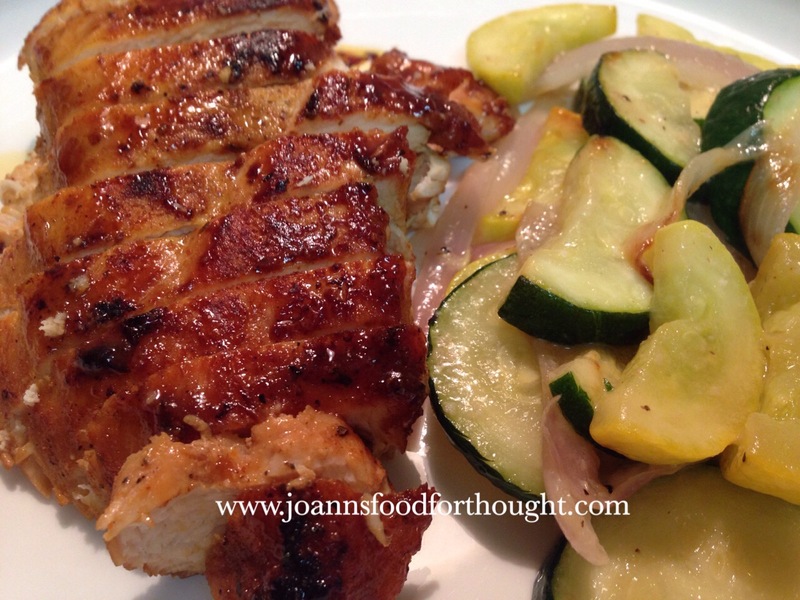 Turn and baste chicken pieces with marinade frequently. Grill for 20 minutes or until chicken is done with internal temperature reading at 165 degrees.